OMG-these cherries are just fabulous! One of my favorite fruits. The shine on them is perfect! Masterful!! And quite beautiful Love the composition. This is really lovely! Watercolors? These look real! Great work Debra! YuM, I could reach out and eat these they are so realisitic. My favorite fruit - over for the year, now... 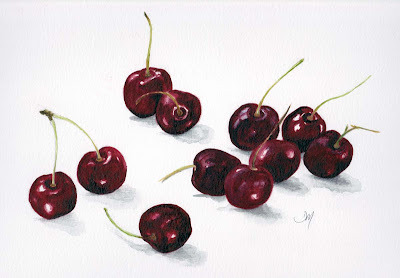 These are luscious, their deep color and glow are wonderfully rendered! These are my favorite fruit too, and you have depicted them marvelously!